Agencies integrated with SMART Finance or Skyward will now have a button to “Return to Finance System” in the top, right-hand corner. This button will take you back to your finance system with zero items in your cart. If you have any questions about Express and finance system integration, call 888-739-3289 or email express@purchasingconnection.org. Great News! School Specialty is waiving shipping charges on parcel delivered items! If you shop School Specialty on Express, or use the service cooperative contract (#AEPA 015-B) to email or fax in your orders, you’ll receive free shipping on parcel delivered items. If your large products come by truck, there will still be a charge for orders under $250.00 list price. If you have any questions please contact your School Specialty sales representative or call the Cooperative Purchasing Connection team at 888-739-3289. 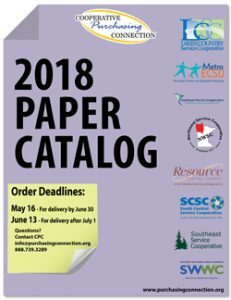 It’s time to order paper! The Cooperative Purchasing Connection offers discounted pricing on white and colored paper. See details in the catalog and on Express. For schools in South Dakota please click on the Read More to see your catalog which has the Southwest/West Central logo in the upper right. Really Good Stuff is now offering an even deeper discount on orders through Express and you get free shipping! SMART and Express time out after 30 minutes of inactivity. To make sure you don’t lose your shopping cart, we recommend saving your shopping cart as a shopping list. The next time you log in, you will be able to access the items from your shopping list. Questions on how to save it as a shopping list? Call 1-888-739-3289 or email express@purchasingconnection.org. We recommend using Google Chrome, Firefox, or Safari for the best shopping experience on Express. Buying in bulk from Nasco? Be sure to punchout to the eNasco store for your volume discounts to be applied. To punchout – Click the globe underneath the Nasco icon. This takes you to the eNasco store where you can search and add items to your cart. When you have your cart ready, click “Secure Checkout”, then on the shipping options click “Continue to Payment & Review”, review your items and then click “Submit Cart” and you’ll be back in Express to either keep shopping or checkout.